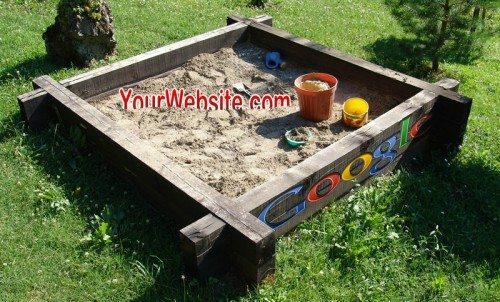 What is Google’s Sandbox Effect and How Does it Effect You? There is a lot of competition to get the highest ranking possible on a Google search, and if you are reading this post it can be assumed you are doing your due diligence to be as competitive as possible. To do that effectively you need to be aware of the terrain you are battling on. Google wants to reward good sites with quality content, but sometimes it takes them a while to determine which sites are superior and which sites are full of spam. To counter spammy websites trying to mimic a real website for hits, Google has introduced updates like Penguin and Payday, and utilizes filters such as the “Sandbox Effect.” Unfortunately, a good website can get caught up in the filter for a while, accomplishing the exact opposite of the original intent to help better websites bubble up to the top of the search. Created to keep the quality of search results high by filtering out disruptive, useless sites, the sandbox effect, also known as the sandbox filter, was designed to essentially place suspect sites, likely spam or lower quality websites using SEO manipulation to lure in hits, in an online time out by suppressing their ranking. Basically- websites experiencing the sandbox effect are cast to the side for a time, buried deep on Google’s SERPs (search engine results page). The time a website can spend in the sandbox is unclear- the general consensus is 3-9 months. The problem is that sometimes a high quality site can get caught up in this filter. So, how does a website end up in the sandbox? Did you know that on average, more than 500 websites are launched a minute according to Mashable? With this constant barrage, how on earth is a search engine like Google supposed to keep up with providing the absolute best search results available? The answer is- they cannot always keep up. If a website, for whatever reason, comes back as potentially suspect or generally questionable, they get caught in the filter. Unfortunately, this filter designed to catch spam heavy websites can also catch brand new websites and sometimes even established ones- it is not perfect. How would a new high quality website find itself in the sandbox? As Google attempts to determine the worth of your website, it keeps many factors in mind and essentially gives you more “points” according the overall quality of the website as it combs over your pages. High quality backlinks and your on site SEO are two factors that are hugely rewarded and normally would raise your ranking. This is common knowledge for developers and some of them are spammers who create websites to simply rank high on Google SERPs taking up those coveted top spots. Being that these websites are designed to bait people, they have little or nothing to offer, which lowers the quality of the search results. Google tries to protect the quality of the experience by doing all it can to protect their SERPs. Sometimes, a great site gets hit for the same reason a spam site would take a hit- it is suspicious because it is almost too good and Google will suppress the site in the sandbox until it determines the value of the website. For the same reason, a new domain is often placed in the sandbox for a time by default, to give Google a chance to evaluate its worth without simply rewarding people who quickly generate spam websites. Sometimes an old domain is hit as updates and changes are made. Perhaps the old domain you purchased recently blogged about the Soap Box Derby for years but now your business specializes in tankless plumbing methods. Google can only compare what content and links pointed to before and after and the huge variance can trigger a stay in the sandbox as they try to sort it out. Expanding your business in a completely new area? Theoretically, this can also trigger a stay in the sandbox. Technically, it is hard to know why it might happen as anyone at any time could be sandboxed. If you have found yourself in the sandbox, there are some suggestions to help you get out faster and, if nothing else, use your time there wisely. Without knowing precisely what triggered your stay can be confusing and frustrating- so focus on doing little things to improve your website so that when you are out and ranking again, you can rank higher. Add new content and continue to improve your website. Make sure you blog effectively- at least twice a month so you have fresh content. This gives Google’s bots a reason to index your site and also makes you more of an authority in your industry and local area in Google’s eyes, both help move your site up in search results. Optimize your sites onsite SEO. As you post new content, add a couple high authority links- not too many subpar links, just a few relevant links. It is all about the quality, and some people have suggested that it was adding high authority links that helped get them released from time out. You may not be able to control being in the sandbox but you can absolutely use that time as efficiently and creatively as possible to ensure your debut on Google’s SERPs is richly rewarded once you have proven the quality of your website.